After last week’s back-and-forth squeaker victory over the Bandits broke the winless streak (which I didn’t write about – sorry, just ran outta time), the 2016 Rock turned into the 2015 Rock for one night, blowing the Knighthawks out of the water 17-6 on Saturday night. On Stephan Leblanc bobblehead night, Leblanc had a great game with 8 points, Colin Doyle had 9 and Rob Hellyer had 11, his third game out of his last four with double-digit points. But the star of the show for the second straight game was Nick Rose who was seeing the ball very well all night and kept the Knighthawks to only 6 goals despite facing 58 shots. That said, Rosey’s point production did drop by 100%. He did have an opportunity near the end of the game with the Knighthawk net empty but wisely chose not to shoot it. In general, I think that if the game is close enough that you pull your goalie, then it’s close enough for the other team to score an empty-netter. That’s the risk you take. If it’s the goalie that scores, so be it. But I’m not entirely sure why the Knighthawks had pulled their goalie, considering they were down by about ten and it wasn’t a delayed penalty situation. Having the goalie score on them at that point would have been showing them up in my opinion, and not terribly sportsmanlike so I’m glad he pulled back. Toronto had it all working on this night. The offense was crisp, the defense was strong, and the goaltending was outstanding. It’s certainly possible I’m misremembering but the only shot clock violations I remember from the Rock were on the PK or near the end of the game when they were running out the clock, and they didn’t have any 8-second violations. The Knighthawks did not have it working at all. Dan Dawson was a little off all night – missing the net with shots, missing teammates with passes, and losing his head and taking penalties. He took two in this one – intentional off-ball contact (by giving Billy Hostrawser a good shove after the whistle) and head-butting. Heat-butting? Is that really a thing? Yup, though this was only the fourth head-butting penalty in the NLL since 2005. Cody Jamieson also took two penalties – one for slashing and also one for off-ball contact on the same play as Dawson’s. As a Rock fan, seeing both Dawson and Jamieson walking to the penalty box at the same time while the Rock only lost Hostrawser was pretty sweet. Even the Rock themselves thought it was a good trade-off. 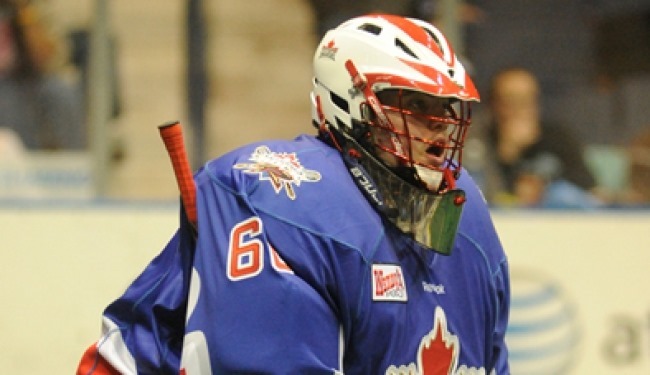 In the 4th quarter, Knighthawk captain Sid Smith took three separate slashing penalties in just over five minutes. The Rock scored on two of them. Toronto scored eight power play goals on the night. Matt Vinc wasn’t on his game either. He was yanked after 14 minutes and 7 goals, though Angus Goodleaf had a pretty good game in relief. He did give up 10 goals but made some timely saves that on a night when their offense was working (and he wasn’t staked to a 7-goal deficit already) would have kept his team in the game. But any time you have Dawson, Jamieson, and Vinc all struggling on the same night, the Knighthawks are unlikely to win. The Knighthawks’ struggles were summed up at the end of the first quarter when they were down 7-1. Scoring on your final possession of the quarter would be a good way to kill any Rock momentum, right? Nope. With just over 30 seconds left, they took a lazy 8-second violation, giving the Rock the final possession of the quarter. Toronto playing like they did on Saturday almost guarantees a win. Rochester playing like they did almost guarantees a loss. When both happen in the same game, you get what we saw: total dominance. It looks like the Rock are back, and now we have to see if they can get out of the huge hole they dug for themselves in the first six games. At the Georgia game, the Rock didn’t play the Mission: Impossible theme in the 4th quarter after I asked them to stop. This week they didn’t play the annoying “Holla Holla” song before the game, a couple of weeks after I asked them to stop. What should I ask for next, folks? Free drinks? Box seats? A pony? I love Bruce Barker’s announcing of Rock games. He’s never once made fun of the opposing team or any opposing players, and always keeps it classy and respectful. But when the Rock score a goal that puts them up by 12 with a few minutes left in the game, I might have held back on the “Toronto: Do you want another?” call. Bill Greer got lifted off his feet and deposited into the Rochester bench, and then he was given a penalty while the Knighthawks who shoved him (Hossack and someone else) got nothing. But then I wondered what rule was broken that should have resulted in a penalty to the Knighthawks. It wasn’t exactly boarding, but surely that would have qualified as roughing, no? Dan Lintner had a great game, scoring a beauty near the end of the second and adding a few assists. I keep associating him with Kevin Crowley and Garrett Billings since Lintner was acquired for Crowley who was acquired for Billings. But Lintner’s game is very different. He’s not firing top-corner bullets like Billings or plowing through defenders like Crowley. Lintner’s game is to squeeze between or around defenders to get in close and it looks like he’s pretty good at it. Odd: In 2015, Dan Dawson had four penalties all season. Two of them came in one game, a game in which Dawson scored 1 goal (on the power play) and had 3 assists but the Knighthawks only scored 6 goals. In 2016: same. It looked (to my friends, I didn’t see the play) like Billy Hostrawser either broke his arm or dislocated his shoulder near the end of the game. I’ve been hard on Hostrawser in the past for taking dumb penalties, but I thought he played a great game. Solid defense, gritty without taking dumb penalties, and the one penalty he did take was justified since he took Dan Dawson and Cody Jamieson to the box with him. I hope he’s OK.
Presenting the NLL Pronunciation Guide for the 2016 season. This is the fifth year I’ve done this, and it seems to grow in popularity every year. Teddy Jenner even linked to it in a recent IL Indoor article. The league makes such a list as well but I saw last year’s, and even that had some names wrong. This was originally done because I got tired of hearing play-by-play guys and other announcers talking about NLL players and butchering their names. As I said in last year’s article, this isn’t really done as a criticism of announcers who get them wrong; many of them are new to lacrosse or the NLL so they’re simply not as familiar with the players as others. Maybe someday the broadcasters will be full-time employees of the teams or league and familiar enough with the players that this isn’t an issue anymore. Until then, I shall persist in this endeavour. Names are organized alphabetically within teams. Kevin Brownell – brow-NELL. brow rhymes with “cow”. Chad Culp – CHAD CULP. Like BIG GULP. Dane Dobbie – DOUGH-bee. Not like Dobby. Bob Snider – SNY-der. Not SHNY-der. Callum Crawford – CAL-um. Not CAY-lum. Joey Cupido – koo-PEE-do. Not KYOO-pid-o. Jordan Gilles – GILL-ess. Not the same as Brad Gillies. Corbyn Tao – COR-bin TOW. TOW rhymes with “cow”. Jordan Houtby – HOWT-bee. Kinda rhymes with “house”. Joe Maracle – MARE-a-cull. Similar to “miracle”. Randy Staats – STOTS. Rhymes with “slots”. Not STATS. Kevin Crowley – KROW-lee. Not like the bird. KROW rhymes with “cow”. Brad Gillies – GILL-ees. Not the same as Jordan Gilles. Derek Searle – SURL. Rhymes with “pearl”. Also pronounced ROOK-ee PUNK depending on who you ask. Matt Vinc – like the name “Vince”. Not VINK. Nik Bilic – bee-LEETCH but many people say BIL-itch. Definitely not BIL-ik. Riley Loewen – LOW-en. LOW is like the word “low”, not rhyming with “cow”. Kasey Beirnes – BEERns. Not BEER-ness and not BURNS. Rob Hellyer – HELL-yer. Don’t forget the Y – it’s not HELL-er. Stephan Leblanc – STEFF-in luh-BLONK. Not steh-FAWN and not luh-BLANK. Dan Lintner – LINT-ner. There are two N’s in there, not LINT-er or LIT-ner. Luc Magnan – LUKE MAG-nun. I would have expected man-YON but I’ve never heard it pronounced that way. Tyler Hass – HASS. Not HOSS. Rhymes with pass. Chris O’Dougherty – O DORT-ee. Or O DOUGH-erty if you say it slowly. Logan Schuss – SHUSS (rhymes with BUS). Not SHUSH, SHOOSH, or SHOOS. Aime Caines – AMY CANES. Swarm assistant coach. Ed Comeau – KO-mo. Swarm head coach. Jamie Dawick – DOW-ick. DOW rhymes with “cow”. Owner & GM of the Rock. Lee Genier – JEN-yay. President of the Saskatchewan Rush. Steve Govett – GUV-it. President & GM of the Mammoth. Mike Hasen – HAY-zen. Knighthawks head coach. Darris Kilgour – DARE-iss KILL-gore. Not DARE-ee-us. Former Bandits coach/GM. Curt Malawsky – I’ve had muh-LOW-skee (LOW rhymes with “cow”) on this list for years but that’s wrong. It’s muh-LAW-skee. Thanks Jake Elliott. Roughnecks head coach. Dan Perreault – pair-O. Sounds similar to my name but the emphasis is on the O. Stealth head coach. Nick Sakiewicz – sic-KEV-itch. NLL commish. Kyle Sorensen – SOR-en-sen. Stealth defenseman assistant coach assistant GM. Kaleb Toth – KAY-leb TOE-th, not TAW-th. Stealth assistant coach. Steve Bermel – BERM-ull. Rhymes with “thermal”. Bandits beat writer. Melissa Dafni – DAF-nee. One of my co-hosts on Addicted to Lacrosse. Tyler Fitch – TY-ler FITCH. My other co-host on Addicted to Lacrosse. Marisa Ingemi – muh-RISS-a in-JEM-ee. In Lacrosse We Trust writer. Graeme Perrow – GRAY-um PAIR-o. Yours truly. Craig Rybczynski – rib-CHIN-skee. Knighthawks broadcaster. Grant Spies – SPEEZ. NLL ref. I’ve watched a lot of lacrosse over the web and on TV during the past several years. I’ve seen games with low quality chunky and choppy feeds, feeds with terrible lag (it’s irritating when you find out about a goal on twitter a full minute before the “live” feed gets there), feeds with video but no audio, feeds with audio but no video, and feeds that just stop. But I’ve also seen games with sparkling, hi-definition, smooth, beautiful video and flawless audio. Much of that is based on the cameras and other video hardware as well as the network hardware and connection, so there isn’t much that can be done short of refitting the arena. You’re not going to get the beautiful hi-def video from the BCA in Rochester because they just don’t have the equipment to do that, whereas the LEC in Langley does – and I’ve seen some gorgeous feeds from the LEC. DO: Use the mid-floor camera almost all the time. Now and again a lower camera in the corner gives a good view, but not always, and not for very long. And the behind-the-net camera is rarely useful unless it’s way up high. DON’T: Switch to the lower corner camera every single time the ball is down near the goal. ALSO DON’T: Install (or ever use) a corner camera that can barely see the net, Mohegan Sun people. DO: Hire broadcasters who are knowledgeable but not biased, or at least not homers. I’ve said all this before. If the announcer is more excited when his team scores than when the other team scores, that’s fine. But if every time a player on one team is hit, he says “so-and-so is knocked to the ground, no call, …” but he never adds the “no call” when someone on the other team is hit, that irritates me. DON’T: Broadcast the in-game host. The people in the arena should hear him/her, the people watching the broadcast should not. DO: Have the broadcasters read my NLL Name Pronunciation Guide. 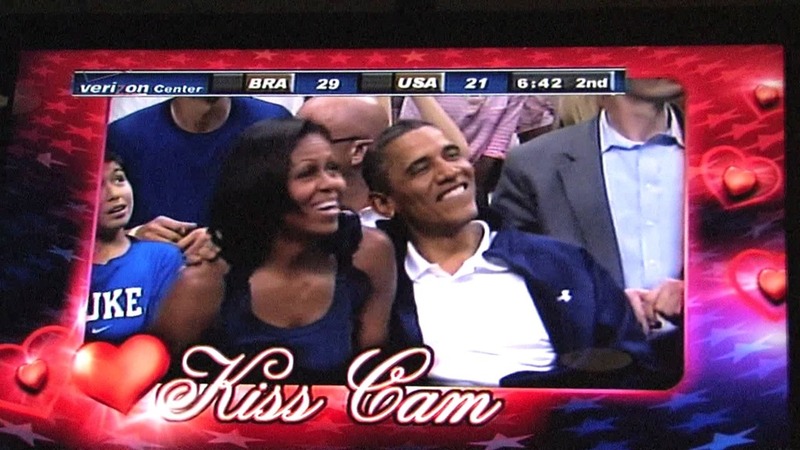 DO: Show the dance cam, kiss cam, “show us your muscles” cam, or just general shots of the audience when play is not happening. That can be entertaining and fun. DON’T: Show any of these while play is on. This shouldn’t need to be said but I’ve seen it happen more than once. ALSO DON’T: Simply show the Jumbotron feed with the “make some noise!” graphics and that sort of thing. Ever. DO: Hire broadcasters who are familiar with indoor lacrosse. If you get field lacrosse guys, make sure they use the correct terms: there are no “ground balls” (or GBs, Randy Mearns) in indoor lacrosse, they are called “loose balls”. (I’ll give Mearns a bit of a pass because he played in the NLL but he’s also a field coach so he concentrates on field lacrosse these days.) Recently a broadcaster talked about a player having his foot in the “goal circle”. We call it the “crease”. DO: If you’re showing a replay, make it obvious by putting a “replay” banner or something on the screen. In a recent Black Wolves game, they showed the fancy swooshing NLL graphic that usually precedes and follows replays but then went immediately back to live action. It took me quite a while to stop yelling at the screen “SHOW ME THE GAME” and to realize that they were. DON’T: Cut to that replay while play is on. Or switch away from live action for a replay of nothing interesting happening as the Black Wolves did in the same game. DO: Display the score, quarter, and time remaining (and ideally, shot clock) in a narrow bar across the top of the screen or in one corner (top left is my personal preference). If it’s possible, also indicate when a team is on a power play (and how much time is left). Other “nice-to-haves” would be an indication of whether a net is empty and when a delayed penalty is called. DON’T: Have this graphic take up the top quarter of the screen. DO: Have the announcers explain some of the weird or lacrosse-specific rules. We understand that not everyone watching is a lacrosse die-hard. DON’T: Let them anywhere near the microphone if they don’t know these rules. Now and again the refs make a call that seems incomprehensible or incorrect because of some information the announcers don’t have. I get that. But when the broadcaster is baffled on why a penalty shot is awarded when a team already two men down takes another penalty, or wonders why a goal scored with 30 seconds left in the 4th quarter is being reviewed when neither coach asked for it, that’s not helpful to the newbies, annoying to the die-hards who are yelling at their screens, and gives a bad impression of the league – that they would hire broadcasters that don’t know the game. DO: If you have someone interviewing the players or coaches during breaks in play or at the end of a quarter, have them ask specific questions. DON’T: Let them take the easy way out and just say “Talk about the play of <Player having a good game>”. ALSO DON’T: Ask how someone is feeling immediately after an emotional loss, whether it’s in OT, or after a big comeback, or in a playoff game. We all know how they’re feeling and they don’t want to talk about it. DO: Interview Alexis Buque after he wins. 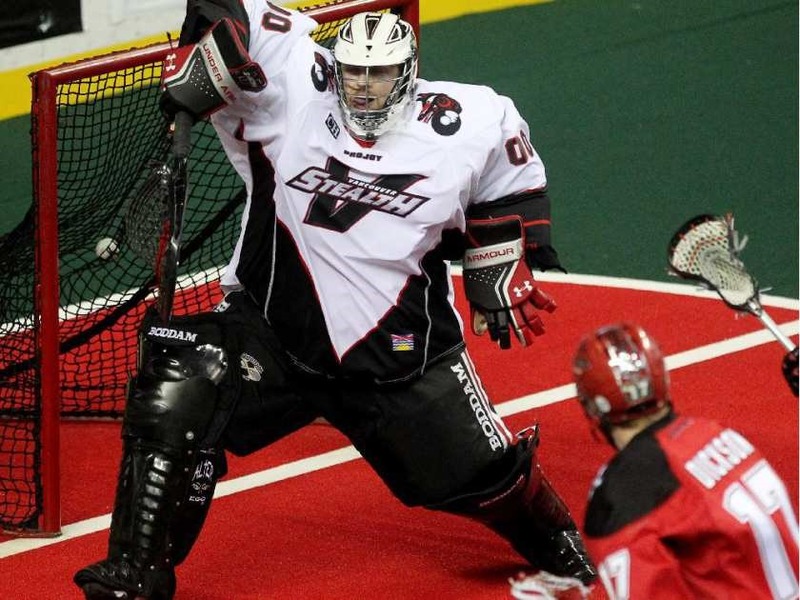 The news came out a couple of weeks ago and caught the NLL world by surprise – Tyler Richards had been moved by the Stealth from the retired list to the “active roster evalutation list”. As revealed on Teddy Jenner’s Off the Crossebar podcast, Richards simply missed the game too much and wanted to return. Normally this would be fine. Lots of people have retired and then un-retired, most notably Gary and Paul Gait in the NLL, Michael Jordan in the NBA, and Mario Lemieux in the NHL. But this one makes me nervous because of the reason Tyler Richards retired: multiple concussions. A number of years ago, Stephen Stamp wrote a must-read article for IL Indoor about concussions and their effect (note that the formatting of the article was messed up in the IL Indoor website redesign from a year or two ago). He talked to Tracey Kelusky, who lost playing time due to concussions, and Merrick Thomson, who had to retire after only two seasons in the NLL. But the most frightening part of the article was his conversation with former Bandit goalie Ken Montour, who was hit in the head (with a player’s knee) during a game and never played lacrosse again. At the time of the article he hadn’t been able to work (as a teacher) in a year and a half either. In some cases someone who is concussed feels weird for a couple of days and then they’re fine. They just “got their bell rung”. But I work with a woman who smacked her head on her kitchen cabinet and was off work for at least 8 months because of concussion symptoms. Kelusky, Dan Carey, and many others have missed significant playing time, while concussions ended the careers of Thomson and Montour and in Montour’s case at least, affected his off-floor career as well. While concussions are still not entirely understood, it’s fairly well documented that people who get them are more likely to get them again. So this is not like a knee or ankle or shoulder injury where with the right medical care and enough rehab, you could be back to your pre-injury level and you are at no increased risk of re-injuring yourself. Richards cannot simply say “I was hurt before but I’m better now.” The more concussions you get, the more you’re likely to get, and the worse they’re likely to be. It’s true that one bad hit could take anyone out of the game for good, but in Richards’ case it’s more likely than others, and the hit doesn’t have to be as hard to cause damage. So Richards is more likely to suffer a concussion than other players, but perhaps he feels the risk is worth it. Remember, he was never told by doctors that he should retire. But he also needs to consider his quality of life if he suffers more concussions. What if another shot to the head ends your lacrosse career and your off-floor career? I imagine that living with chronic knee or shoulder pain due to sports injuries is no fun at all, but having to live with headaches, dizziness, and difficulty concentrating for the rest of your life would be much worse. I’m sure Richards knows all of the risks. I’m sure he’s talked to doctors and his family and the Stealth people and they’ve all come to the conclusion that this is a good idea. Who am I to tell him he’s wrong? That said, I can’t help but feeling a little uncomfortable with it. Remember, he’s a goaltender so it’s not as if he’ll be fine as long as nobody cross-checks him in the head. People are shooting a rock-hard rubber ball at him as hard as they can. Taking shots off the head is an absolutely unavoidable part of his job. I wonder how many players who we enjoy watching today could have had their careers cut short if the NLL hadn’t made a point of cracking down on head shots in recent years. Would we have missed watching Shawn Evans for the the last few amazing years? Or Cody Jamieson? What if Brett Hickey had been concussed by a hit to the head in his final game with the Stealth? We might have been deprived of his remarkable 2015 season and a remarkable young athlete, and he would have been deprived of a lot more. An interesting question is how will this affect opposing shooters? If you’re Kevin Buchanan and can shoot 100 mph and you’re facing TRich, do you dial it back a notch hoping not to be the one to end his career? Do you shoot low even if you see a high opening? Do you try a cross-crease dive if there’s even a chance you run into him? I can’t imagine that none of the opposing players have thought about this. This isn’t just changing your behaviour because different goalies have different strengths and weaknesses, this could be taking it easy on him so as not to injure him. The cynic in me can’t help but wonder if this gives the Stealth a tiny little advantage. I totally understand that a team wants to take every advantage it can get, but I’ll be honest, using something like this to your advantage seems a little scummy. This should go without saying but I wish Richards nothing but the best in his return. I hope this is all for naught and he never suffers another concussion. He’s not even 30 so he could have another decade of lacrosse in front of him. However I know that whenever I see him between the pipes and someone is rearing back to fire a laser at him, I’ll be hoping for a goal so that the ball misses his head.